PLEASE NOTE IF YOUR PREFERRED DATES ARE UNAVAILABLE WE HAVE OTHER PROPERTIES THAT MAY SUIT. Lakeview Cottage sleeps four people and boasts some of the most spectacular sunsets on the eastern seaboard of Australia. Overlooking Wallis Lake, flanked by the World Heritage Barrington Tops, this property is surrounded by national parks in the village of Green Point. An easy three and a half hours drive north from Sydney between Pacific Palms and Forster. 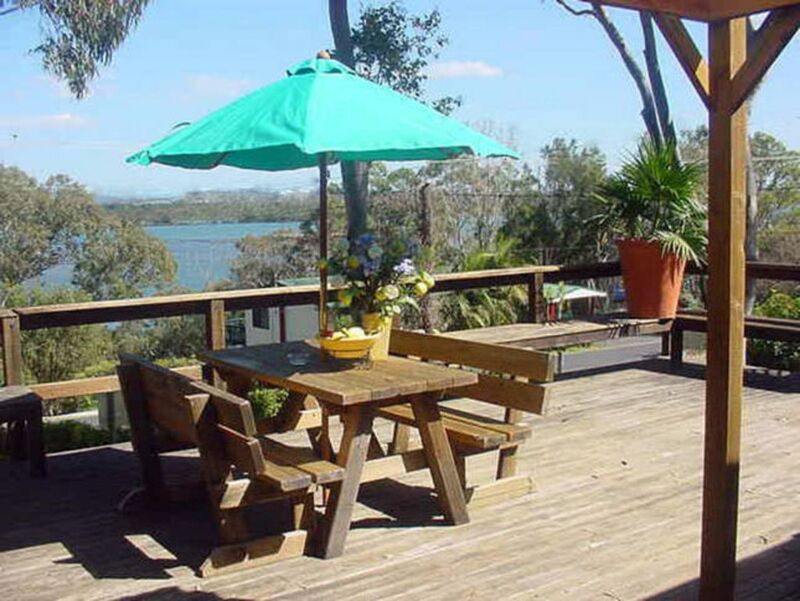 Fishing, surfing, snorkling, windsurfing, walking or just relaxing on the huge sun deck overlooking Wallis Lake and enjoying one of the best iced coffees around from the Country Palings Cafe and gift shop close by. 1) In the event of any cancellation made by the Principal a full refund of all monies paid will be given. 2) The premises are left to you only for the period stated on the letter of confirmation as short term holiday rental. 3) A bond of $1000.00 is payable for Bluebell and the Folly and $500.00 for Lakes Edge, Lakeview Cottage and Lakeview Lodge. This will be returned as soon as possible after departure subject to compliance with our Conditions of Tenancy. 3) Pets must remain outside of the property (Strictly no pets allowed in Bluebell or The Folly), they are strictly not permitted inside the house or a cleaning fee of $150.00 will be incurred. Some dogs feel uncomfortable in unfamiliar surroundings, particularly when left alone, please consider our neighbours and ensure barking is kept to a minimum. 5) The premises are let strictly for the enjoyment and use of the number of people stated on this letter i.e. the number of people occupying or using the premises shall not exceed the party size agreed at the time of booking unless prior permission is sought. Exceeding this number will render the booking liable to cancellation, plus a fine on the bond. 8) The premises are to be left in a clean and tidy condition garbage placed in the bin before departing (red for general garbage and yellow is for recycling); additional fees may apply if the premises are not left in a reasonable condition. 11) Please report any problems or incidents promptly. 12) Vendors or their agents shall be allowed right of entry to the premises at any reasonable time to inspect the premises or make repairs. 13) Parking – please ensure cars/boats are parked on the concrete driveway and not on the grass which can become waterlogged after rain. 16) Any bonds will be refunded within 48 hours of departure upon compliance inspection into the nominated account or refunded to credit card. Should any damage be detected then the cost of repairs will be taken from the bond. 17) The Principal accepts no responsibility for loss, injury or damage to any member of the hirer’s party or their property, however caused, arising in any manner out of the let of the premises. 18) Should you have any complaints regarding your stay, please call us immediately. We will respond as soon as possible to resolve any issues. In the event of any problems please call . We had a wonderful time at Lakeview Cottage. It's very comfortable and has everything you need for a delightful stay. Close to beaches, restaurants and a lovely shopping centre to browse thru and have morning coffee. Beautiful views and a very nice owner. Would we go there again? In a heartbeat! The cottage was very well presented, with personal touches through out making it very homie. Back yard was safe for our dogs with solid fencing. Clean and a view to contemplate and relax with. The house was fully equipped and had a brand new bbq and a big deck that was amazing for a good dinner. The nly problem was the amount of mosquitos in the deck and the house because the house was located right by the lake. We had to burn a lot of insents to get rid of the mosquitos. So it will be nice if the owners has those available and something in the rooms. Location was perfect if you wanted to completely relax and be away from people. Beaches we're nearby as well so it was a good spot to explore the nature. Chryso, many thanks for taking the time to review our cottage. Yes, the mosquitos have been extremely bad since we had a large amount of rain a few weeks ago. This is unusual but the same issue is prevalent throughout the Great Lakes at the moment. There are mosquito coils provided all the time under the kitchen sink plus insecticide for the interior. Yes, our region is renowned for its natural beauty and fabulous beaches and we hope we can welcome you back some other time. Although we weren't there long we had a great stay in this pet friendly cottage near Foster. The cottage was clean, close to town and hade great views of Wallis lake from the front verandah. The area was very quiet and relaxing and the amenities of the house were perfect for our stay. Loved the house . Good setup had everything we needed . It was awesome hanging out on the deck in the sun looking over the water . We will be back again .